Piriformis syndrome: the sciatic nerve runs under the piriformis muscle so muscle tightness or spasm in the piriformis muscle can compress the sciatic nerve. Pregnancy: the extra weight and pressure on your spine can cause compression of the sciatic nerve. Spinal stenosis: your nerves travel through spaces in your spine and these spaces can narrow (stenosis) significantly so that it puts pressure on the nerves in your low back. Trauma: you can injure the sciatic nerve through a car accident or other trauma such as a skiing or horse-riding accident. “The Wallet Syndrome”: men typically put their wallets in their back trouser pocket which can then compress the sciatic nerve when they sit down. Sciatica should not be confused with referred pain from the low back musculature which can also produce pain down the leg. 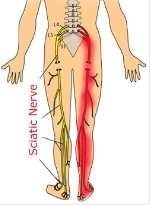 Sciatica is specifically a nerve irritation problem. How does one get sciatica? Sometimes we can relate it to a specific event such as a car accident; however it is more commonly the result of repetitive minor events which have an accumulative effect. Years of bad posture, poor work ergonomics, improper lifting and bending, poor muscle tone, excess weight and many others causes all lead to minor damage. Then all of a sudden when we do a daily task such as bending over to tie ones shoes we get a severe back pain and can barely straighten up again. Spinal degeneration can also cause sciatica due to the arthritic changes that occur on the vertebrae called osteophytes which compromise the space normally framing the nerve.